Island Home Park Shoreline Improvements As part of the Tennessee River Studio, this project proposed interventions along the shoreline of Island Home Park in Knoxville, TN that both stabilize the riverbank and provide improved access to the water for the citizens who utilize it. A floating wetland jetty on the upriver side of the park acts as wavebreak, a floating dock acts as watercraft launch and fishing access, and a series of concrete planters embedded in the bank stabilize the soil in concert with planted vegetation. 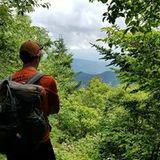 During the Gap Analysis phase of the Tennessee River Studio, our team stitched together activity data from Strava and other GIS sources to map outdoor recreation activity, opportunities, and access along the Tennessee River. We also proposed the creation of a 652-mile water trail (blue) as well as a 962-mile bicycle route (yellow. Sonar fish-finder Multifunction water quality sensor Leersia sp. Riverside Infrastructures These renderings illustrate conceptual designs for riverfront engagement as part of the Tennessee River Studio. These are a series of representations acting as commentary on the representational aesthetic of the firm SCAPEâ&#x20AC;&#x2122;s work. A decolorization scheme was utilized to convey necessary information without excess. These towers and planting plan are an ecoprototype designed to encourage the nesting of fruit-eating bird species in a specific area. A sculptural aesthetic value coincides with a diverse fruit-bearing plant palette to facilitate these goals. net acidity in the presence of water. Partial Development Scenario Planted Area: 10,509 sq.ft. Planted Area: 26,611 sq.ft. Small-scale plots for education, demsontration, and research into substrate, materials, etc. OMNI Ecosystems Infinity Grow Media (pH altered) 1/8” 6061-T6 Aluminum Plate Lightweight 1/2” Pumice Gravel This proposal utilizes existing and experimental green roof technologies to create a lightweight, adaptible experimental plot for the exploration of new substrates and plant palettes. The cedar glade ecosystem, endemic to the nearby Cumberland Basin, is well-adapted to the extremes of moisture and temperature that exist on a roof. This project will test a variety of pH-adjusted substrates to test efficacy and plant survival rate with minimal irrigation. EPS-12 Geofoam allows us to create height variation while maintaing low weight. Moisture probes, linked to an Arduino Rasperry Pi, monitor soil moisture content and communicates to a Rain Bird irrigation controller when soil moisture drops below a certain threshold. A set of 5’x5’ square irrigation heads provides even moisture content for each plot. A solar panel integrated into the project powers the microcontroller systems. All infrastructural systems are linked via an underlying system of welded, lightweight aluminum tubing. All control systems are hidden in an easy-to-access hatch hidden within the tallest test plot. STATUS: EXERCISE ONLY NOT FOR CONSTRUCTION REVISIONS NO. DYNAMIC COMPACTION: This project, completed Spring 2018, explored a site in Nashville, TN undergoing development from industrial zoning to residential. 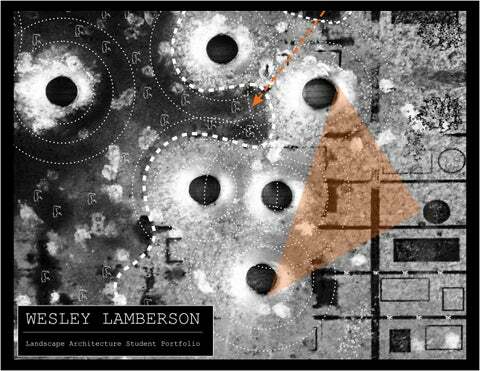 Leveraging GIS and Grasshopper software, a series of drawings were produced that explored the possibilies of rubbleization of existing buildings and the use of said rubble as fill on-site. These soil and topological conditions were considered to be ideal for novel wetland and cedar glad ecosystems endemic to the Nashville area.